I mean, I wasn’t really wrong, at least not when I landed in Dallas about twenty hours later. It was in the low 50s (Fahrenheit) when I arrived, and within two days the temperatures climbed to the upper 70s. Just before Christmas, they plunged. Evidently the winter weather followed me with a one week delay. I escaped the cold of Dallas by going to Charleston, which welcomed me with brilliant blue skies and balmy mid-60s temperatures, only to go in to work on my very first day to hear that there was a pretty massive snow storm forecast the next day. 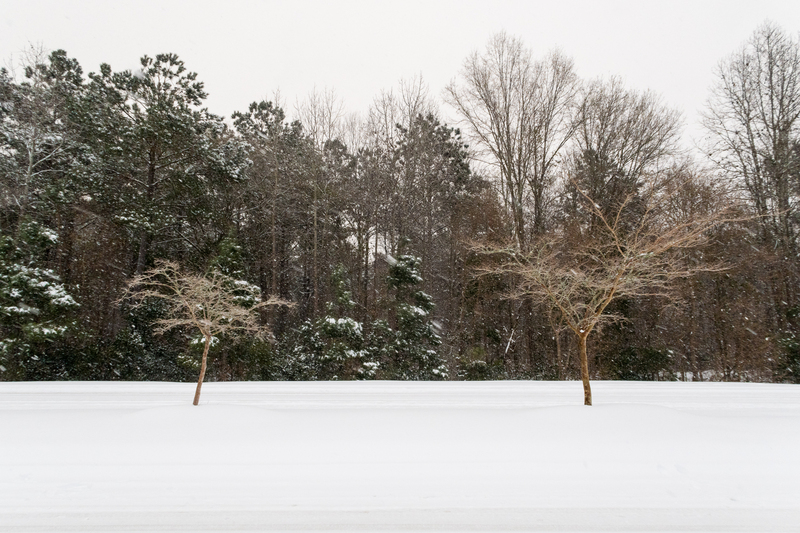 I shrugged it off; if it snows in Charleston, an inch accumulates and melts before the sun makes it overhead. Instead, as I walked to the office on my second day of work, I was shooed out before I made it in the gate because the plant had decided to shut down during my drive in. Now I had dragged the cold and snow from Europe to Dallas to Charleston. My assumption that any accumulation melts by midday also didn’t hold. 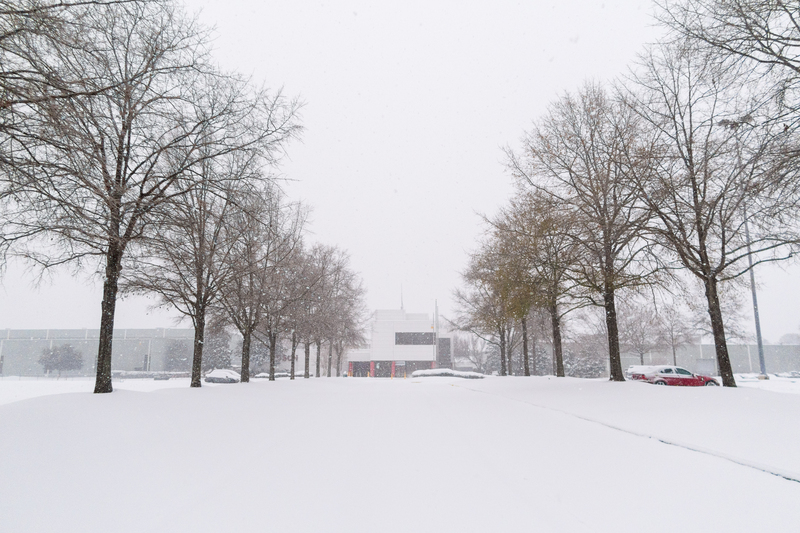 For one, fluff started to fall by mid-morning with nearly 6″ sitting prettily by 6 PM, and worse, temperatures stayed below freezing for the rest of the week, ensuring the snow that fell remained through the weekend. On Friday, with no clear end to frozen runways in sight, my flight was cancelled, forcing me to drive to Charlotte at 1 AM to allow me to make my connection back to Zurich (where, ironically, the snow I cautiously driven through three weeks prior had completely melted). 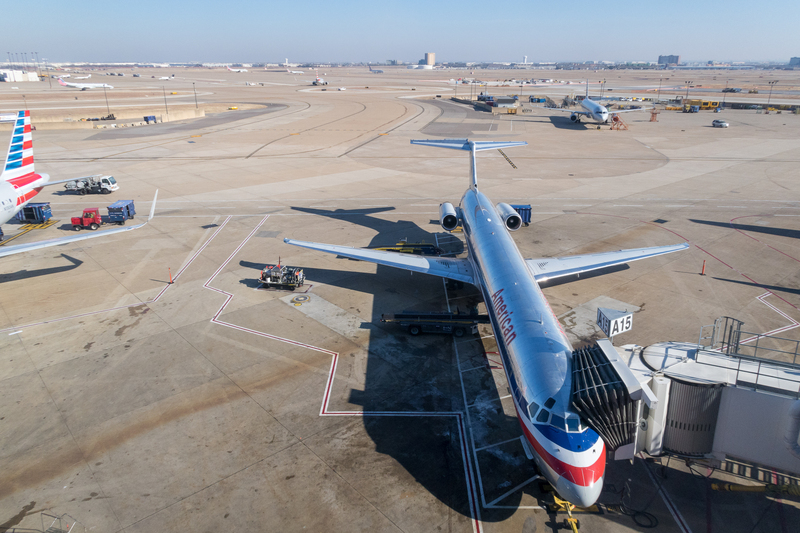 After the most unproductive week in Charleston I’ve ever experienced, I eventually did start the journey back, spending a good amount of time in a much sunnier (and by this time also snow-free) Dallas Fort Worth Airport. 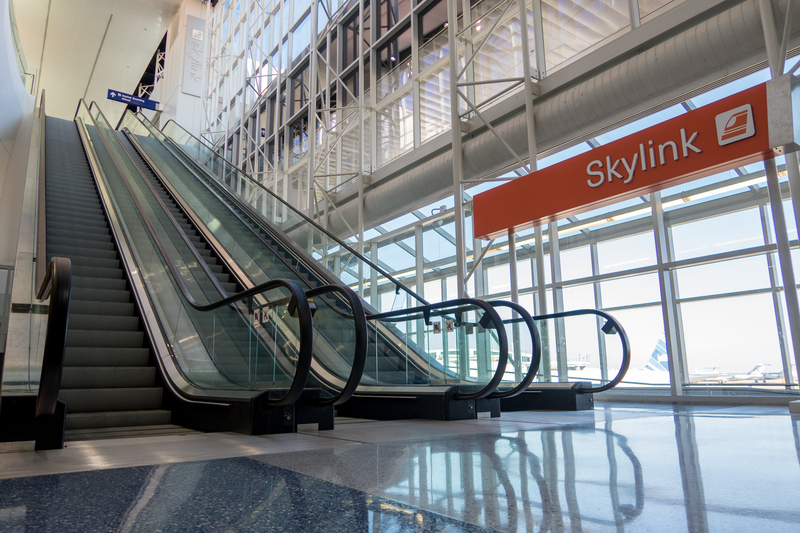 I arrived early enough that their terminal transit system, Skylink, was still nearly deserted. To burn off time, I rode around until my camera battery died, which given the cold it was subjected to a week prior admittedly didn’t take too long. 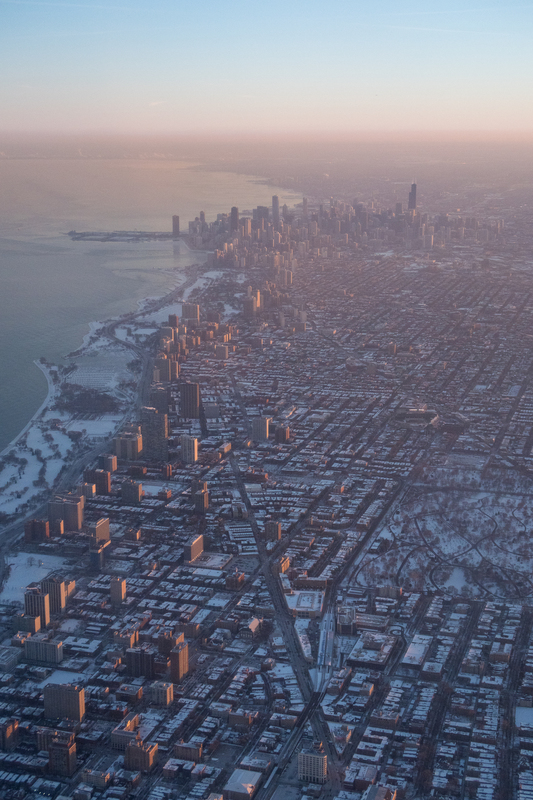 Eventually, I boarded my flight to Chicago, where I saw — you guessed it — snow. Again. It was a beautiful evening as we began our approach into ORD, but I had brought my G7X Mark II and turned up the screen brightness earlier this trip, not realizing doing so really messed up its exposure accuracy. I ended up underexposing my shots by two full stops, which I realized as I started going through photos after I got back to Germany. Whoops. Up until December, it had been a somewhat rainy but not snowy winter, which I assumed meant that up in the mountains it would also have been raining fairly often. Quite the contrary, in fact; unlike previous winters, which were perhaps colder but without much precipitation, this winter was above freezing in the valley but below freezing above, meaning the mountains were completely socked with snow above 1200 m elevation. (One ski area mentioned 3.3 meters of snowpack on its slopes!) In February I took two friends snowshoeing, thinking we’d get lucky with the one day in the week the forecast predicted good weather. 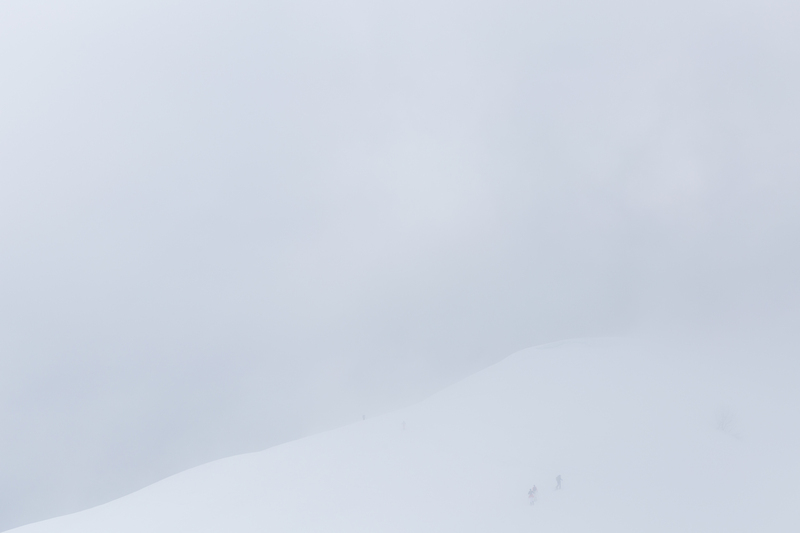 Mostly, we just saw the snow beneath our snowshoes and clouds, sometimes spotting skiers in the distance if we focused hard. After lunch, we drove to Neuschwanstein, which we wouldn’t have recognized as being the correct destination if not for the massive hordes of tourists. 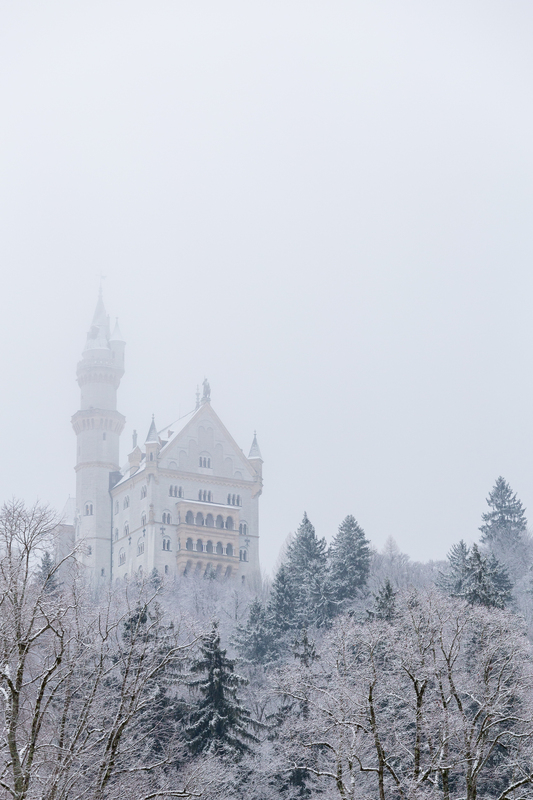 It, like the Riedberger Horn earlier that morning, was cloaked. Despite the poor visibility, it was at least not raining, so we headed up to the castle, hoping to get onto the Marienbrücke. Due not to maintenance as its closure sign read but to the threat of “roof avalanches,” the Marienbrücke was closed, so we really didn’t get any views of the castle until we were crossing the street while heading back to the car. As we turned to check for oncoming buses that have little regard for pedestrians, we saw the castle for the first time. 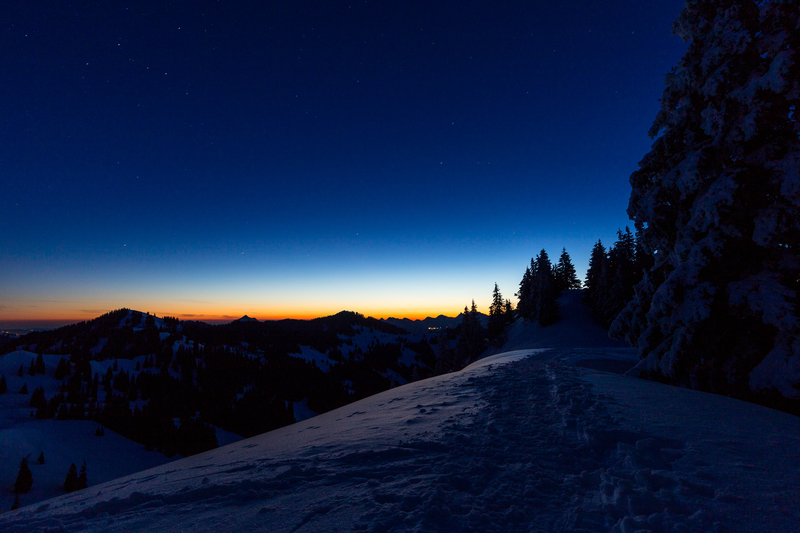 Not having any views from the Riedberger Horn didn’t help with my desire to take sunrise photos since I first did a snowshoe tour there last April, but the energy to head up never emerged last year. Since the cloudy day in February thwarted my grandiose vision, I planned two more hikes up this winter, both times my alarm failing to stir me from slumber. Finally, in some odd twist of logic, I gathered my strength and hit the trail the day before daylight saving time started — for this reason possibly the least intelligent day for a sunrise hike of the whole year — arriving at the parking lot at 4:04 AM. I changed into snowshoes, reaching the saddle by 4:52 AM. In the calm of the night, the blue sky started to give in to reds and yellows along the horizon. I had expected a 1.5 hour snowshoe to the summit, but at this pace I was on track to reach the summit by 5:30 AM, a full hour before the sun would rise. It was cold but fairly still, so I didn’t freeze as quickly as I had thought I might. On the other hand, the snow was frozen enough that I probably didn’t need my snowshoes, which with every bite made quite a vicious gnawing sound, followed by a squeal as my foot and snowshoe deck rotated in the shoe. I continued my loud march upward, stopping again as the saddle began to climb. Despite the lightening sky, I was still the only one on the mountain. The foreground from the Riedberger Horn doesn’t lend itself to jaw-dropping landscapes, so while I stopped to watch the sun rise, I didn’t photograph it directly. 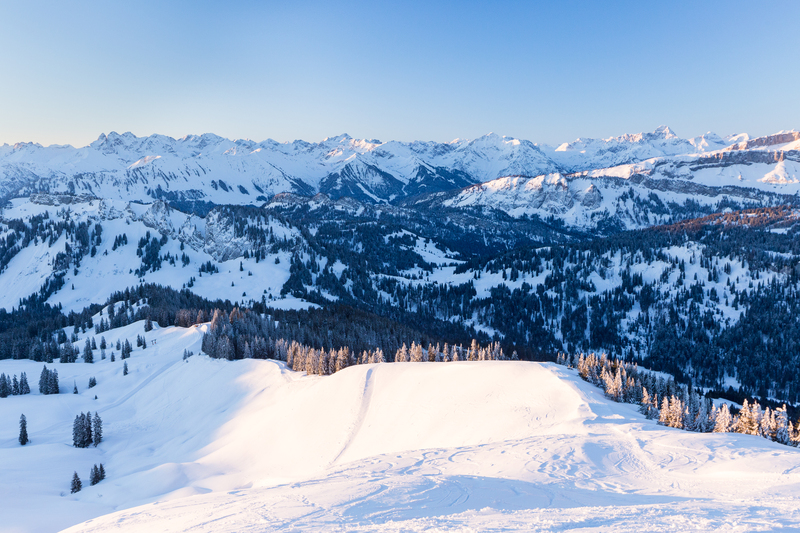 I headed up to the summit to be able to say that I had been up there for a sunrise hike, snapped a few shots as the first rays illuminated the shoulders of the slopes below, and headed down. I saw only one person during the whole trek; I wondered if this meant the snowfalls that chased me across the Atlantic in December might be starting to taper off. Adding to the folly of a earliest-possible-sunrise-of-the-year, my early toils one day prior were met with an equally early start the following day, as I was due to head to China for a work trip. 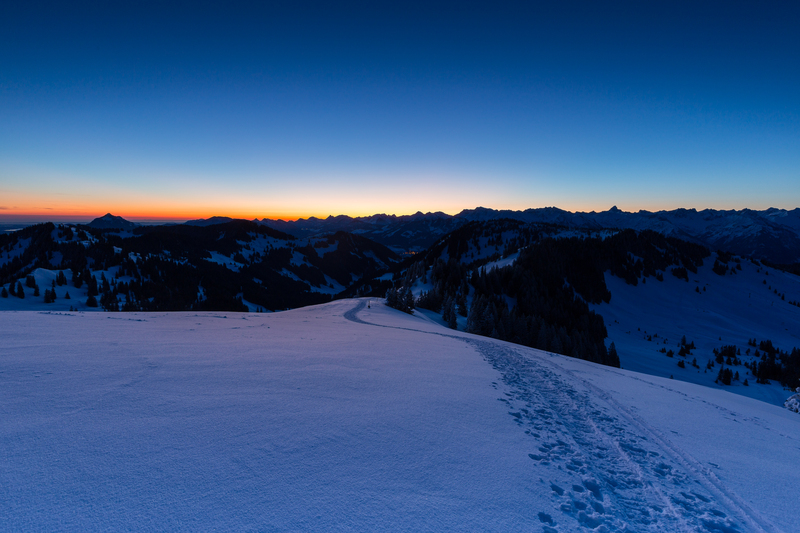 I therefore got to see a second sunrise, two more than I had seen in the Allgäu all of last year. I was aboard a China Eastern Airlines A330-200 for last year’s flight to our plant in Suzhou; this year, the metal upgraded to a Boeing 777-300ER. I was beyond excited — after all, I never thought I would fly in business class in a B77W — and, almost as if to further remind me how silly that sunrise hike was, I got to see yet another sunrise (now the third in a row) as we approached Shanghai. But no regrets. 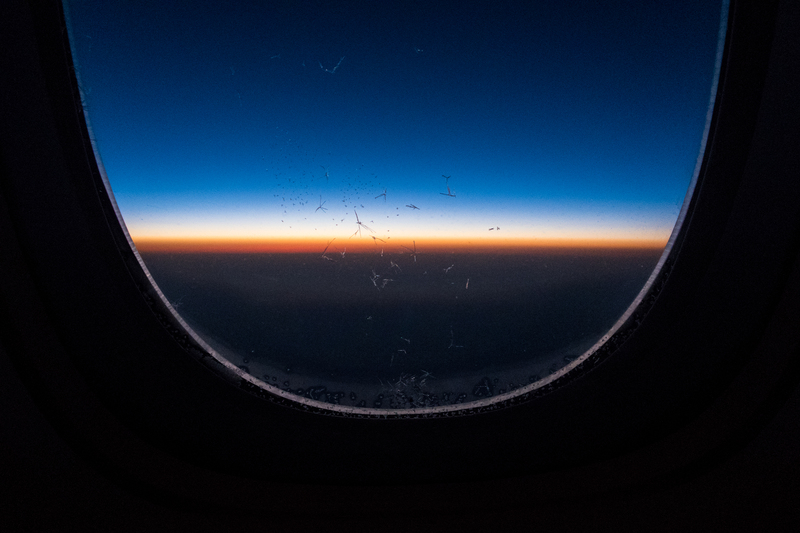 Although business class is superb for a few reasons, the large distance between window and seat does not make taking low-light pictures without reflection or glare or distortions easy. This time, our hotel was the Hyatt Regency. I had really enjoyed the breakfast spread at the Crowne Plaza we stayed in last year, but the Hyatt’s interior is more dramatic. 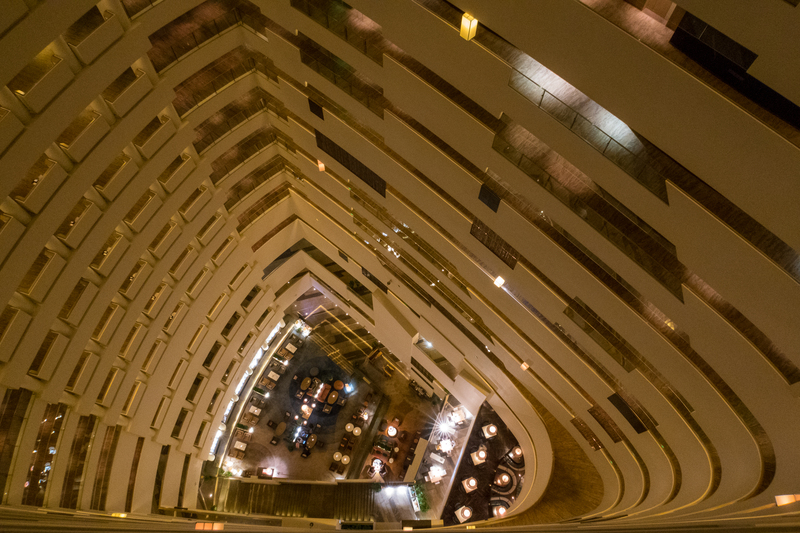 Its shape is similar to that of a candy corn kernel, its atrium empty from ground floor to roof, 25 stories above. A colleague had described the hotel as “cold” — that wasn’t our experience this trip, as high temperatures in Suzhou were well in the 60s. Winter, at least here, seems to have faded away. 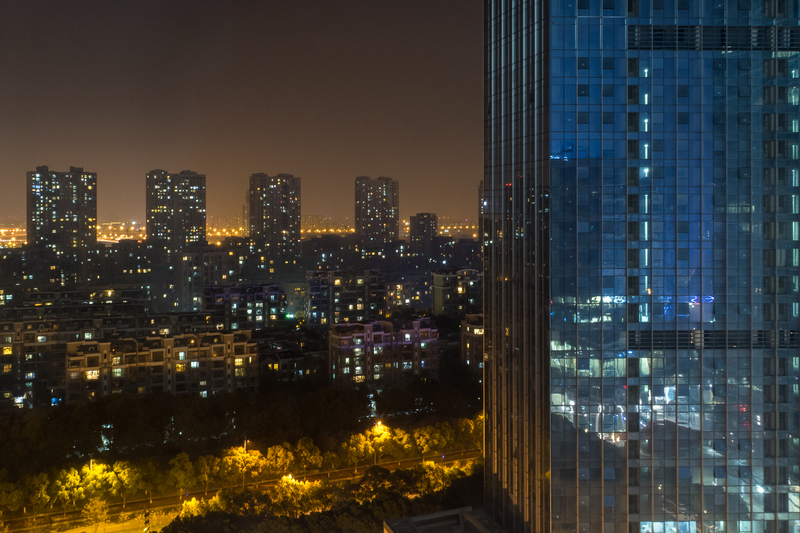 My room was seventeen stories up, but there wasn’t much of a view in this part of Suzhou. I didn’t mind; after the short nights the previous few days, I was happy to get to sleep in a comfortable bed. Behind the din of my workload, the tick-tock countdown of my time in the Allgäu is starting to grow in volume. I’ve begun to appreciate having four seasons and a strong winter and living in a region that values elevation gain. I have a growing suspicion that returning to warmer climes will be harder than my repatriation to the U.S. in 2011 was, despite the country of origin and country of repatriation being identical in the two cases. It’s probably why I really wasn’t offended when winter weather seemed to follow me from Europe to and then around the U.S. on my home trip: for the first time, I had a reminder in Charleston that what I’ve seen here and the mountains I’ve come to know here will still somehow stay with me on my return. ← Do, gibt’s ne Huimat!